I really enjoyed Novik's previous book, "Uprooted", and I think this book was equally good. 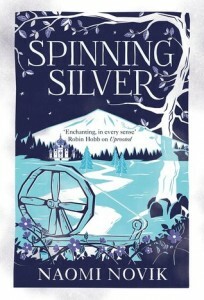 “Spinning Silver” starts off as a fairly mundane story following a young woman in a rural village in medieval Eastern Europe trying to support her struggling family by taking up the family trade of money-lending, but it gets increasingly fantastical as it goes along when Miryem's knack for making gold out of silver brings her some unwanted attention. I thought even in the early stages the story was compelling due to the tension between Miryem's family and their neighbours who hate them even as they borrow money from them. The plot would later expand significantly as events start to threaten the entire Kingdom, but even when this happened it didn't lose it focus on the characters. There are times when some of the plot developments are a bit predictable, but at other times there are some surprises - such as the outcome of the first meeting with the Tsar. The characterisation was good, the three women who are the main protagonists of the story have similarities in their determination and that they are all trying to make their way in a world which doesn't pay much attention to what they might want, but there is also quite a lot of variety in their characters. The supporting cast was interesting as well, even most of the characters who initially appear to be antagonists become more nuanced and somewhat sympathetic (with a couple of glaring exceptions) as we find out more about them. It was also very atmospheric at times, particularly in the scenes set inside the Staryk's realm, although I did slightly regret that I wasn't reading it in the middle of winter with snow falling outside, which would have been apt.